Waking up to a beautiful snow dusting your lawn can make your morning a little brighter. Waking up snow banks blocking your sidewalk can really put a damper on the day. This package includes 2 snow shovels. 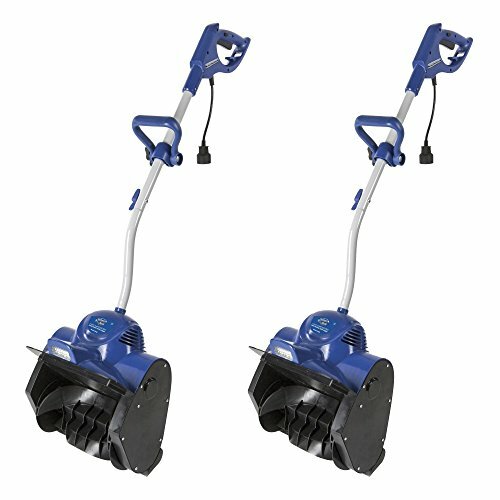 Save time, money, and labor by using your Snow Joe 11-Inch 10-Amp Motor Electric Snow Shovel to quickly clear decks, steps, sidewalks, and patios. The 10-amp motor moves up to 300 pounds of snow per minute. The 2-blade paddle auger cuts an 11-inch path up to 6 inches deep. The ergonomic body with an adjustable handle minimizes strain. Toss your snow up to 20 feet away at a time.